2nd Floor- Queen bedroom, Full Bedroom, Shared Tub-Shower Bathroom, King Bedroom with En Suite Stall Shower Bath, Bedroom with two twin beds. One of our signature properties, the Bayberry Cottage is located in the heart of one of Maine's most beautiful areas- Cushing. 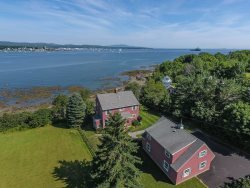 This exquisite 4 bedroom cape is a beautifully appointed waterfront home with views of the Saint George River and Penobscot Bay from almost every room. Located conveniently in the Midcoast area, the Bayberry Cottage offers the best opportunity for a vacation retreat. Relax in the stately comfortable rooms that are appropriately decorated in antiques with a nautical flair. The wicker sun porch is a comfortable place for evening cocktails and has a painted compass rose on the floor reminding you of the ever present allure of the sea. Travel outside to the open patio/deck, a great spot to watch the lobster boats traveling by while enjoying your morning coffee or a glass of wine. A beautiful English garden separates the house from the ocean. The pier offers a good place to dock a large vessel if needed or provides a perfect spot for launching kayaks from the property. As a private dock, it is all yours to enjoy! BOATS INCLUDED? None, however SUP & Kayak Rentals are available from Maine Sport, 40 minutes north in Rockport. Sometimes, if the order is big, Ducktrap Kayaks will deliver to this property. Dock Access: Yes, Pier and shared Dock (with swim ladder), please note, there is only 2' of water at low tide at the dock. Check in and check out procedure was seamless. Directions to the property were sent as stated one month before occupancy and easy to follow. Lovely maintained property with stunning gardens. The very well equipped kitchen made the family cooks happy. Our favorite experience was having morning coffee on the back deck. What a glorious view of the St George. The dock allowed access for kayaking. The front yard had plenty of room for a rowdy croquet game ( in the rain no less). Comfortable beds and newly redone bathrooms ... greatly appreciated. The house and the views from everywhere were absolutely stunning. The house itself was beautifully laid out and perfectly suited for the number of people who stayed there. Every - and I mean every - kitchen item was perfect. I have used vacation rentals many times and in several countries. On The Water in Maine is the most well-managed and detail-oriented agency I have used. They were very helpful and knowledgeable. Bayberry Cottage is an amazing property in a beautiful setting. Everything we could ever need for a perfect vacation was provided. The comfortable furnishings, beautiful decor and obvious love the owner puts into the cottage made our stay perfect. This is our third year renting through On the Water and, true to form, the agency was efficient, friendly and helpful before and during our stay at our rental. Because of personal circumstances, we had to arrive a couple of days late, and very late in the evening, at the start of our two weeks at the cottage, and Justin was helpful and very accommodating in response to this change in our plans. Bayberry Cottage is the perfect vacation property! We loved the gardens, the location and the thoughtful details for a comfortable stay that the owners have provided. The house is very comfortable ~ even on a rainy day (which we didn't experience the entire two weeks we were there!) when snuggling up on a couch with tea and a good book would be delightful! We toured the Olson property (A. Wyeth fame) while there ~ which is just down the road from Bayberry Cottage. We had our daughter and her husband with us for part of our stay, and they loved the place as much as we did. Thank you for offering this wonderful property for us to enjoy! Very professional and courteous and thorough and welcoming. The location of the house is perfect. Wonderful views of, and access to, the water. On a quiet road, off a quiet road, in the quiet town of Cushing, but just a 25 minute drive to Rockland. Beautiful sunrises, sunsets and moonrises over the water. We'd be delighted to return. Smooth as silk, without any problems. The property is beautiful, the view perfect. We're sad to be going home. Everything was great! We booked everything relatively last minute and overall it was seamless. When we arrived, we were immediately content with the decor of the house and the modern kitchen. Checking in was a breeze and we were able to kickoff our holiday without any headaches. When we experienced a problem with the well, it was immediately fixed. The property is absolutely beautiful! As a gardener I was enchanted with the vast array of flowers, hydrangeas, lovely deck and dock. The decorating is comfortable and pleasing to the senses. Kitchen supplied better than mine! I can't think of anything one might need that isn't there. It was great. No problems at all. We loved the location. Right on the water. Watching the lobster boats each morning was wonderful. The furnishing were beautiful. The gardens are amazing. Flowers blooming everywhere. Very well organized clear instructions makes makes things very easy for both the renter and the property owner. A really great house and property. It is more of a three bedroom versus four bedroom house . The view is tremendous. This is our 4th year of renting a vacation home with On the Water in Maine (and 2nd year at Bayberry Cottage). Everyone at your office is very friendly and accommodating. Just when we already thought you were the best at what you do, you top it. Delivering my husbands prescription medicine packages after we forgot that home to us at the house after we had sent to your office seemed like an easy thing, until we later learned that your office is over a 1/2 hour from the Bayberry Cottage. You delivered them as if it was an easy thing to do - and free of charge. Kudos to you! This was our 2nd year at the Bayberry Cottage - next year will be our 3rd! We've stayed in a lot of vacation homes around the world - and Bayberry Cottage has fit us the best. We love the well equipped "cooks kitchen", the deck off the back of the house, the new patio area down by the dock - and even just sitting on the dock itself. The welcoming furnishings that include a mix of antiques and Pottery Barn flare are just as I would furnish the house if it were ours. We especially love kayaking trips from the dock. Next summer, we may rent a power boat to explore a little further. You are truly lucky to have such a fabulous home! This was the third time we rented a house through "On the Water in Maine" and we know the drill by now and are comfortable with it. Everything is efficiently organized and the entire renting and the arrival and departure process is hassle free. We would definitely not have repeated renting from OTWIM if it were different. We had three wonderful family vacations. As far as Bayberry Cottage - The house is exceptionally well maintained. Its kitchen and two bathrooms have obviously recently been renovated.